Twenty years into our democracy, how has South African history begun to define the youth of the 1970s and 1980s? Increasingly, their role in South Africa’s struggle for freedom and subsequent liberation is being revered and today, we marvel at their successes in mobilising, defending and leading their communities with dedication, commitment and service. Sacrificing their education – and very often, their lives – youth across South Africa successfully mobilised their peers and made their voices heard. Today, as we consider the role that our youth must play in building a post-apartheid South Africa, we wonder whether our young people have shifted from being a mobilising to a mobile youth. Have mobile phones become the new everything? We see that the rapid growth in access to mobile communication, and the expansion of mobile internet, has introduced a prolific space for youth to engage with the world. 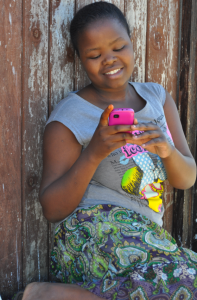 Our young adopters ofthe mobile internet increasingly use their mobile phones to; communicate [and gossip], search for information [and partners], study, sell and purchase goods online, upload “selfies” and share cartoons, video-clips and memes of political mishaps. More recently in South Africa, mobile and online channels have become an important source of political news; Facebook, Twitter, MXit and other chat platforms are the new political players. During the build-up to South Africa’s 5th democratic election, we saw mobi users status updates, posts and tweets reflect current news stories and articles analyzing our past, present and future political landscape. Very often, these were followed by hammering comments which led to critical and constructive discussions and debates. We responded with excitement as we saw political parties and organisations move with the times and respond to the mobi-movement with mobile-centred campaigns and live chats where young people got the opportunity to engage with – often disagreeing and opposing – leaders and members of political parties on their mobifestos. But, except for brief periods like these, the mobi-movement in South Africa largely appears to be another [digital] talk-shop with no real impact, just another middle-class fad which continues to reflect the reality that for the majority of people in this country, mobile use is limited due to high data costs and/or lack of supporting infrastructure in remote and rural areas. Nowhere in South Africa have we witnessed, for example, the use of mobile phones as technologies of freedom, used to mobilise citizens in a way seen in the ‘Arab Spring’ uprisings between 2010-2013. Why, we ask, is there not continuous and robust mobi-discussion amongst our youth of the political and social challenges that they face; high levels of unemployment, school drop outs, corruption, poverty, gang and gender based violence, substance abuse, poor quality education and service delivery, and the lack of youth representation in decision-making processes? And, what would it take to support our young people to effectively channel their ideas, energy and enthusiasm into strategies for achieving social justice for all citizens? If we accept that young people represent our future and therefore, that we need to support our youth to invest in themselves and build their commitment to public innovation- a process of continuing improvement of policies, programmes, systems and institutions for public benefit, our mobi-generation needs to mobilise beyond the mobile phone or start actively driving social change. Our loud and powerful youth voice, present on social networks, needs to be supported to make the shift to action; create and use other tactics (besides violent protests and digital talk-shops) to lead change in their communities, schools, workplace, social-spaces and ultimately the country. other social challenges’ impeding young people’s potential to lead South Africa to vision 2020. We invite young people to submit their ideas in the form of a one-page pitch or a 2-minute video clip proposing intervention(s) to the above to gamechangingleaders@dgmt.co.za. If your pitch is fresh, creative and bold, DGMT will consider supporting its further conceptualisation and development with the view to possible DGMT programme funding in the future, provided it fits in with our funding strategy (read more here).